Visits to country houses are an important leisure pursuit throughout the British Isles, not just to appreciate their superb architecture, great paintings and elaborate furniture but also to experience something of the past life of our great families and their households. Mark Girouard suggested in Life in the English Country House that ‘even when the customs have gone, the houses remain, enriched by the accumulated alterations, and often accumulated contents of several centuries. Abandoned lifestyles can be disinterred from them in much the same way as from the layers of an archaeological dig’. By the 19th century, life in most country houses changed as a result of various technical inventions such as improved water supplies, flushing water closets, boilers and pipes to provide central heating, internal communications by bells and then telephones, and better lighting by means of gas and electricity. Country houses, however, were usually too far from urban centres to take advantage of centralised sources of supply and so were obliged to set up their own systems if they wanted any of these services to improve the comfort of daily living. Some landowners chose to do this; others did not, and this book examines the motivations for their decisions. It also sets out to discover what evidence has survived for the impact of technological innovation on the buildings, contents, parks and gardens of country houses and on the lives of the people within them. In the course of their research, the authors have visited nearly one hundred houses around the United Kingdom, mostly those open to the public and the majority in the hands of the National Trust. Many books have been devoted to the life of those in domestic service in such houses, but this book looks not so much at the social records of their lives as the actual physical evidence for the greater levels of comfort and convenience sought by landowners in country houses from the 18th to the early 20th centuries. Marilyn Palmer is an Emeritus Professor of Archaeology and President of the Association for Industrial Archaeology. Ian West is a historical archaeologist and chartered engineer. ... magisterial volume ... The research is presented in an engaging way ... Indeed, the book is attractively produced altogether. 'Technology in the Country House' is full of fascinating details which enliven the core narrative .... is nothing less than a visual treat that reveals many of these previously hidden locations. ... an absorbing investigation of the adoption of new technology and a fascinating look at the instruments of domestic life on a grand scale. ...Palmer and West do us a service by showing how understanding domestic technology is critical to understanding how people lives - both the life of comfort that the owners experienced and the life of toil of their servants. 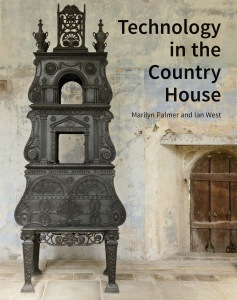 'Technology in the Country House' is an excellent survey and introduction to the subject and a starting point for further study and investigation of the introduction of technologies in a domestic situation. Beautifully illustrated throughout with a succession of photos from properties all over the country, this excellent collaboration between the National Trust and Historic England isn't just a fascinating insight into a neglected aspect of domestic history. ... exhaustively researched study ... the beautifully illustrated volume ... the volume by Palmer and West is a laudable contribution for understanding technology in the country house and its ramifications.